For several months, Senate has been working on a bill to reform the immigration system and is now getting ready to vote on it. While Republicans aren’t exactly excited about giving out American citizenship to anyone other than older white Christian males, many of them still wish that the reform happens and helps improve the GOP’s reputation among the fast-growing Hispanic voter block. So here are 10 Republican proposals to reform immigration. 1) Because the immigrants should have a path to citizenship, but not a blanket amnesty, the reform will offer young immigrants a way to win American citizenship via a Hunger Games-like contest. 2) Employers who have hired undocumented workers will punished by fines and having to hire only American workers from now on. 3) The Republican Party will try to reach out to Latino voters by rephrasing the party message so that it will resonate with Hispanics. Speaking of which, how do you say “get the hell back to your damn country” in Spanish? 4) People who want to live in this country must learn English. This means that those people who still don’t know the difference between “There”, “They’re”, and “Their” will be rounded up and deported. Their have been warned. 5) The path to citizenship should not be a cakewalk. Instead, anyone who wants to become a citizen should have to jump through hoops and hurdles – because our country only needs the immigrants who are physically fit. 6) For the guest worker program, United States Citizenship and Immigration Service will streamline the issuance of work permits and hang-around-the-water-cooler-and-surf-the-Internet-all-day permits. 7) To reverse the flow of illegal immigrants from Mexico, fence posts on the border will be equipped with “Bienvenidos a Mexico!” signs facing south. 8) Homeland Security should step up surveillance and deportations of the groups that are likely to be involved in violent terrorist acts. Judging by recent shootings in Newtown, Aurora, and Arizona, we should begin by deporting white Americans. 9) To protect the border, Border Patrol will need to hire 50,000 new agents. However, since the agency’s budget had been cut as a part of sequester, the agency won’t be able to afford to pay even the minimum wage to new hires – which will ensure that the number of undocumented workers in the country will immediately drop by 50,000. 10) Since the United States attracts immigrants simply by being one of the richest and most tolerant countries in the world, we can remove the incentive to immigrate to the US by making the country poorer and more bigoted. This entry was posted in List of 10 and tagged humor, Immigration, Immigration reform, Mexico, Political satire, Politics, Republican, Republican Party, satire, United States. Bookmark the permalink. Nobody is going to hire American workers… they are lazy and want breaks and money and all kinds of crazy stuff like that. Ha, just like Aus. They complain there are no jobs but are too lazy to do any work that is available. Hey… we may be lazy, but we invented the coffee break… and the eight hour work day… and the five day work week… okay… we are just lazy. We also make the best junk food snacks. You can’t take that away from us. But it is all we have left. We used to be the best at lots of stuff. Agreed maybe someone should..One of the things our country is still ranked TOP of the list at? Obesity..We have the most obese people in our country on the planet. To top that those of us who aren’t obese? See the impact in our high , but excellent so I’m not complaining, insurance rates. As Americans we’re excessive in all that we partake in..Guess never heard of too much of a good thing; can be a bad thing, huh? I’m not even going to try. Well, at least Americans invented all that, and that took some work. Oh good, cause I’m not an American. Not American either?… you are just full of surprises. I am officially American now – but it wasn’t always that way. The way things are in the world, it is nice to know that some people still want to become Americans. Change Spanish and Mexican to Indonesian etc and US to Aus and I think w on the same page. Oh yeah, that too… Or maybe not. To be honest, Australian Liberals are left of American Democrats. Your Teapublicans have shifted the whole political field so far to the right that centrist is not conservative. That’s very true. The entire political spectrum is so far to the right that it’s just crazy. Stupid Teapublicans. Some of our Teapublicans have pushed so far to the right that they’ve already pushed right through a mental asylum. Ain’t that the truth! They now inhabit a world untouched by the spelling and grammar fairies, too. Too bad we have to live there instead. The fairies are good to nice people… Batshit insane teabaggers aren’t so lucky. That’s why they fled. Brilliant as usual. Numbers 1 and 8 are my favourites. I’m pretty sure there are many Republicans who would support an immigrant Gladiator fight to the death. Thank you! I can’t believe they haven’t officially proposed it yet. Republicans aren’t keeping up with world news. Yesterday Britain invented the trick of charging 3000 GBP (yes, thousand…though they claim it will be only a deposit) for a UK visa for visitors from some countries. Apparently the idea is to use the money to deport lazy, complaining white folks who don’t vote right and make room for more hard-working and happy immigrants who will not be able to vote. I haven’t seen this story yet, I’ll look it up. It sounds like UK suffers from the overflow of tourists from some of these countries – because now to visit UK the tourists from these countries have to have 4000 or so pounds to be let into UK. Does the same apply for its and it’s? Love reading your work. Thank you! I hope this policy won’t apply to its and it’s, because I could get deported for that. Unlike these violent white people. I love waking up to a new List. #1, waiting for the public-access feed of carnage. #4, yes, yes, yes! #10, I think we’re well on our way. Thank you – and I love waking up to your comments 🙂 #1 – I’m sure the ratings would blow away any competition. Maybe we could enter an exchange program, wherein we bring in people who desperately want to become citizens because their countries are really that bad and we deport Republicans that want to succeed, act like whiny twits, etc. I’m thinking a total win-win there. They would TOTALLY go for the Hunger Games. Not that long ago people watched executions while having picnic lunches. Come to think of it, some people will go watch executions even today. Talk about the ultimate “Survivor” show. It’s a pipe dream of my own to gather up all the people who brag how they achieved everything without the help of the government (and even despite the government interference), and ship them off somewhere where there is no functional government, like Somalia or Afghanistan, just to see how well they can do there without the government getting in the way. I’ve watched the movie recently, and I am absolutely sure that real-life Hunger Games (it will probably be called Border Games in this version) will get good ratings. In fact, as I was watching it, I occasionally thought of the ways to make HG into a more watchable reality show. I like your idea. The author said she got the idea for the HG book when switching channels between coverage of the Iraq war and reality TV. It’s really the cheapest and easiest option, and it will filter in only the smartest immigrants. 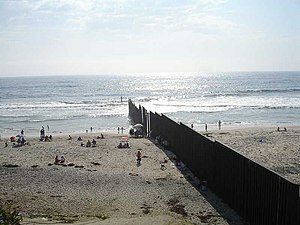 It’s been proposed that building a giant wall along the US/Mexican border would keep out illegals from south of the border. People with an understanding of undertaking such a huge landscaping job have pointed out that we’ll need a lot of Mexican and Central American day laborers to accomplish it. Others have pointed out that it would still be a feasible project, we just have to make sure they build the wall while standing on their side of it. I’m thinking it could be a giant wall of ice, like in The Game of Thrones. That way, all the immigrant workers can have permanent jobs in keeping it maintained. I think there should be mandatory tests as a part of any election, asking basic questions like whether Earth is flat, whether Medicare is a government program, whether 1st amendment allows freedom from religion, and so on. I love No. 4. That should eliminate much of white America aged 18-35, who haven’t learned much in high school. It also eliminates phone texting which can’t discriminate the various “there’s” and often makes mistakes. The Unites States already has a self-deportation program, since anyone is free to leave the country. The only country that doesn’t have this program is North Korea. I really love all of these but number 4? Truth is a dangerous thing. Why should we require immigrants to speak English? Most of us can’t speak it anymore. You might be tempted to think it’s related to the income level or level of education. While I will admit that you are more likely to get better English from someone with a PHD; it isn’t a given any longer. I have had discussions with my children’s high school teachers that have left me in tears of grief for what they do to the language. TEACHERS. It goes without saying that our educational standards are in serious need of adjustment but it isn’t just that. Our entire educational system needs to be redesigned to accommodate the new technologies and their effect on the student population. As an immigrant, I used to have a lot of conversation like “How many years have you been in this country? X years? Your English is very good!”. The way things are going, I may soon start complimenting the native-born Americans on their English. Seriously though. Where did you hatch? What area of the country do you live in? I am from Baltimore, Maryland originally, though I have been gone from there for many years now and live in a more Northern part of Maryland. You can refuse any request for personal information without insulting me. I understand the need to limit what we reveal in this venue. I love Nos. 1 and 8. Perhaps we can combine them. Hunger Games-like contests between crazy white men with guns. That’s an excellent idea! The problem is that crazy white people with guns see each other as less of a threat, than, say, an unarmed black teenager. They can defend themselves, as Zimmerman’s lawyer did, with knock knock jokes. I thought the joke was funny – just way out of place. If Zimmerman’s lawyer doesn’t get it, then Zimmerman got exactly the lawyer he deserves. Yup. One of the keys to humor is never trying at the wrong time. Zimmerman’s lawyer didn’t get that memo. So that we finally have a good reason for why the country needs to be in decline. Freakin’ hilarious as always, dude. I think numbers 4 and 8 are my faves. If both are enacted, the majority of the country would be deported. I like the hunger games one too. That one really puts this into perspective. Thank you! I do think that people who yell “Them dam imgrints oughta learn English! !” need to learn English themselves. And while they’re at it, give them the civics and history test that citizenship applicants have to take before becoming citizens. I helped my wife study for the citizenship test. It’s harder than people expect. I know a lot of born and raised citizens wouldn’t be able to pass it. I had to pass it myself, and there were some difficult questions, like “name 4 wars the US fought in 1800’s”. 1812; Mexican-American; Spanish-American; Civil War. Tougher than it sounds. I almost missed the Spanish-American War. I always think of it as a turn of the century conflict but it was actually fought in 1898. I remember History class. So many of the kids 40 years ago paid no attention and couldn’t even answer this one question. Pass a test? No way. I’m sure if you find the test, you’ll be able to answer every (or almost every question), but an average American probably will miss quite a few. By the way, I don’t think there was a question about the wars in 1900’s – probably because there were so many that it could get very embarrassing if someone started naming them all. I counted at least 10 and probably forgot some of them. Perfect. But perhaps we can add to this list the H1B, L1 and J1 programs? No, that sounds way to sensible to actually pass. Yes, I’m sure it was the undocumented people who crashed the economy, voted to elect Obama, caused 9/11, bombed Pearl Harbor, and crucified Jesus. I just have to wonder, before those undocumented people came here, weren’t people still commiting crimes in the US? Or was it just the people who were undocumented at that time, but once they got documents, they magically stopped committing crimes? And of course, every human in the Northern and Southern America had descended from someone who immigrated from somewhere else. Even Native Americans aren’t exactly native, but crossed over from Asia thousands of years ago. So everyone in the US is an immigrant or a descendant of one, it’s just a question of how long ago it happened. Preach! So well & beautifully said..I concur 100% and to the N degree. Exclamation mark & PERIOD. Might have to borrow that response..